For any individual residing in Grosse Pointe, MI and who is looking to rent a party bus, then your search for the company is now at an end. Here at Rockstarz Limousine and Party Bus, we specialize in providing our clients and guests with an amazing time in our party bus no matter the reason for your celebration. Whenever you are looking for a party bus in Grosse Pointe, the most important thing of all is to know that your every needs will be catered for allowing you to just enjoy your time. Well, that is exactly what you get when you use our services from the professional driver to the expanded party bus that allows you to invite even more guests than ever before to celebrate with you throughout the evening. Our Grosse Pointe party bus rental service is designed to provide you with your own private nightclub as you cruise around the area. From the mind-blowing sound system that will take your music to a whole new level to the eye-catching laser light show that has been included simply to add an extra bit of atmosphere, we know that you will be blown away by your time spent with us. 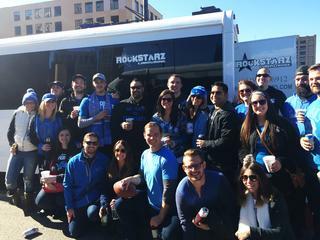 In the past, people have contracted our Grosse Pointe party bus service for a whole host of different reasons to celebrate. Whether it be either a special birthday, or just any old birthday. An anniversary of a date that means to much to you. Perhaps even just your bachelor party before you get married, the actual reason is entirely up to you. So, any resident of Grosse Pointe who is looking for a party bus should give us a call at Rockstarz Limousine and Party Bus. If you don’t want to call, then you can also contact us via the form on our website and someone from our company will then be in touch at the earliest opportunity.